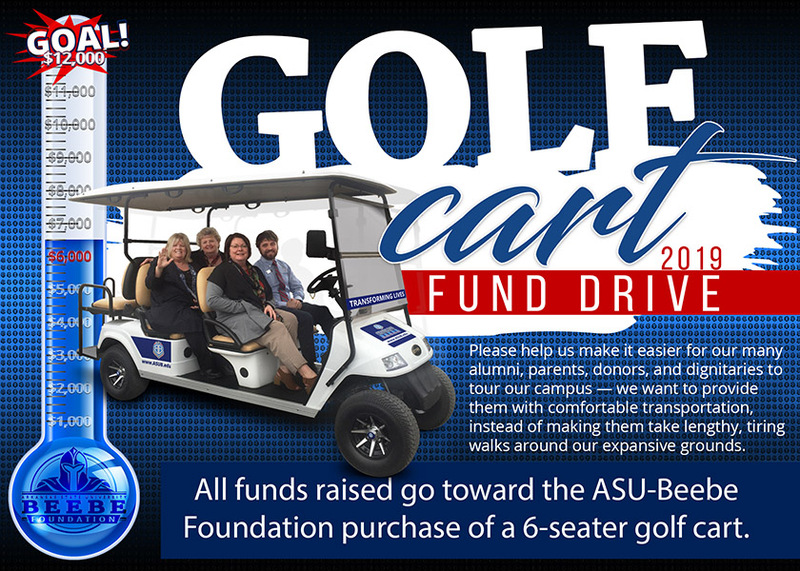 The ASU-Beebe Foundation announces a focused fund drive for the purchase of a 6-seat golf cart to transport special guests during campus tours and events. Beebe business owner Cathy Eoff (second from right) makes initial donation to kick off the ASU-Beebe Golf Cart fund drive with a check for $3,000. 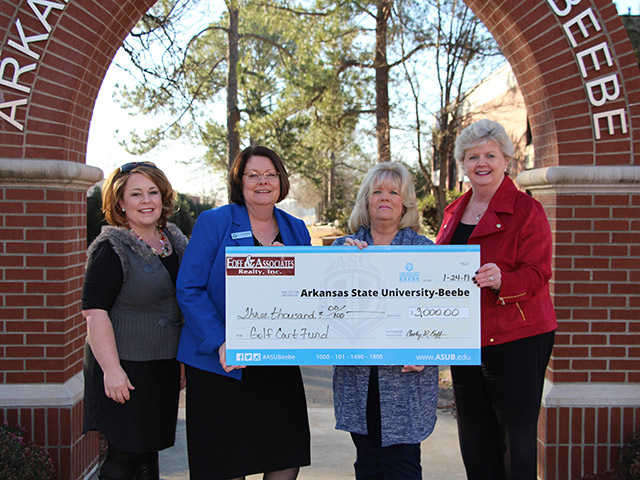 Pictured with Eoff are (l to r) Andrea Cole, ASU-Beebe Development Officer; Dr. Jennifer Methvin, Chancellor of ASU-Beebe; Cathy Eoff, and Rose Mary Jackson, ASU-Beebe Vice Chancellor for Institutional Advancement. The offices of Institutional Advancement, Admissions, as well as the Chancellor’s office and the ASU-Beebe Foundation identified the need. The cart transportation would greatly benefit these departments, who regularly host tours for prospective students, parents, alumni, elected officials and other guests. Cathy Eoff, owner of Eoff & Associates Realty, Inc., serves on the ASU-Beebe Board of Visitors and the ASU-Beebe Development Council, and made the initial donation to kick-start the fund drive with $3,000. This fund drive is focused on raising the remaining amount needed for the purchase. The golf cart is a STAR 48V-4+2. It is white with tan seats and equipped with foldable rear seat creating a flat bed space to carry boxes or other materials for special events. The cart will bear ASU-Beebe graphics on the exterior for easy recognition.